If you need any help or advice on sizing then please do not hesitate to call us on 01476 513840, we have a team of experts at 4dobbin who specialise in riding apparel and will provide you with a prompt and friendly service. This is available from 9:00am to 5:00pm Monday to Friday, outside of these hours, please leave a message on our answering services and we'll call you back. 1. A body protector should be fitted over light clothing and heavier garments worn over the top. 2. 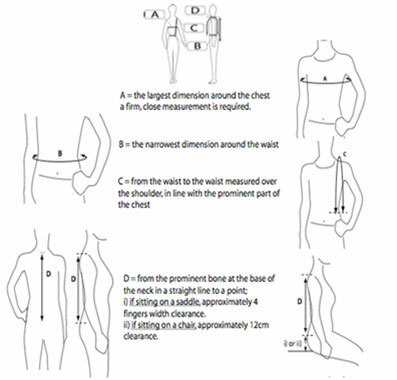 Take your chest, waist, over shoulder (waist-to-waist) and back length measurements in cm, then find your size using the charts within your chosen style. 3. Once you think you have the correct size body protector, and before trying on, loosen the chest and waist fastenings and flex the garment to soften the foam. 4. Fasten at the chest and waist, ensuring that the contrast-coloured control markers are covered and there is enough room for adjustment. 5. Once the body protector fits securely around the chest and waist, choose the length appropriate to your height. The shoulders and neckline should lie flat against the body. If this cannot be achieved, you may need a shorter length. 6. Check the back length by sitting on a saddle and simulating all riding positions. There should be approximately a hand's width between the saddle and the base of the garment. At the front, the body protector should reach your breastbone and cover your bottom rib at mid-chest by 25mm. 1) Measure for half chaps over your normal socks and breeches or Jodhpurs. 2) Sitting down with your knee bent and your foot flat on the floor, measure around the widest point of your calf. 3) Then measure from the back of the knee to the floor. 4) New chaps should fit snugly without feeling restrictive or uncomfortable. Adult X Large 16" 17"
Waist 14" 16" 18" 20" 22" 24" 26" 28" 30"
Waist 20" 22" 24" 26" 28"
Waist 18" 20" 22" 24" 26" 28"
Whether you are selecting a collar for the first time, seeking a replacement or looking for something that little bit different you will notice that your local pet store has more than enough choice to help in the confusion. Questions of size, fit, comfort and choice of material are sometimes difficult to answer, especially when faced with the large display of colours and finishes now available. These are some helpful pointers to make selection a little easier! What size collar do I need? Ancol have produced a new-collar size guide that helps identify the collar for your dog and is simple enough to remember when looking for a replacement. The new sizing is 1-10 with 10 being the largest. The conversion chart below will help you recognise the imperial/metric size for each collar, although this information is still included on the tags. Display boards in the shop have illustrations of over 50 breeds of dog to help you recognise the average collar size shown for each type. A tape measure has also been provided, which will convert automatically to the new sizing. The new sizing is relevant to all types of Ancol collars whether it is made from nylon, leather or an adjustable product. Most collars have sufficient holes to make an adjustment up to 3" so it is normal to expect at least two sizes of collar to be able to fit comfortably. Remember that neck sizes do vary between the sexes and weight of your pet so an accurate measure is always recommended before purchase. As a general guide the following breeds of dog show the collar sizes based on an average size and weight of the mature dog. For crossbreeds choose the type your dog most resembles by size comparison. How to fit the collar? Do not fasten the collar too tightly. You should be able to place two fingers under the collar when fastened. I t is important that your dog feels comfortable when the collar is on, and different collar types suit different breeds of dog. For example a "round" sewn dog collar is particular good for long- haired breeds of dog, and a soft air-cushion collar useful for older dogs or for ones prone to irritation around the neck area. What type of collar should I buy? Ancol make a wide range of collars from high quality bridle leather to ones making a colourful fashion statement! The choice of material and style is left to you -and your pet, but here are some useful guidelines. Leather is a natural material with a number of benefits. Made well, it looks very smart, is strong and water-repellent, however, if your pet is guilty of constantly chewing, or enjoys swimming, it may be better to invest in a synthetic fibre like nylon. There are many leather collars and leads on the market but there are very few made to the same quality standards as the Ancol range. Each one is made from the best bridle leather that has a consistent grain and thickness and uses natural vegetable tanning processes. The feel, smell and texture of the leather are important checks to make before buying. Some inferior products will crack when folded, and split after very little use. The natural oils of a good quality leather provides an excellent water barrier, but if the product is dry and brittle then it will quickly be damaged by the elements and need replacing after a short period of time. Ancol's top of the range is the Timberwolf with soft textured leather, for comfort and durability. It is also specially treated with a water repellent chemical [similar to Scotchguard®] to enhance it's durability in adverse weather conditions. Leather is commonly used for the production of special lines for certain breeds of dog. The Bull Terrier is one of the most popular examples of beautifully handcrafted leather using a combination of bridle leather with brass decoration made to traditional patterns. Other breeds including Mastiffs, Boxers, Doberman and Rottweillers are favouring this type of collar and lead. Other unique shaped products are made especially for whippet and greyhound collars. Ancol has a bright colourful range of blue, red and black nylon and ribbon designs and tartan patterns in the latest fashion styles. Nylon is one of the strongest man made fibres which is colour fast, completely weather proof and very difficult to chew through. They are suitable for most breeds of dogs. Ancol has four varieties of material to select from. The basic Ancol nylon is made to a high manufacturing standard with brass eyelets, washers and heavy gauge die-cast buckle. There is also a range of softweave , with a soft textured finish designed for the tongue of the buckle to penetrate the fabric in any required position for a comfortable fit. The Nylon Air -Cushion fabric encapsulates thousands of tiny air pockets giving a remarkable soft cushion effect for the dog and the owner. This new technology is proving very popular for dogs constantly pulling or older pets that welcome the softer feel of the material around its neck. Nylon Ribbon leads offers the benefits of strength with the fashion colours and patterns available on the printed fabrics. The strongest material with specially welded links making a bright but indestructible system. This type of product can be sold separately as a choke collar, chain collar or combined with leather or nylon as a check chain. Choke collars are good for training larger dogs to walk to heel without constant pulling or straining at the leash. Used inexpertly this type of collar can cause neck or throat injuries so please take due care when using this collar. For training purposes the Nylon and check chain collar has a lot of advantages and provides a safeguard to prevent too much pressure being put on the dogs neck. The Ancol chain collar looks very smart with the tongue section finished in bridle leather, and the collar in a choice of two or three row chain. These collars are usually made from nylon material and as the name suggests can be adjusted for a range of neck sizes, The fixing method is normally a quick release catch and the collars are used for convenience when going for a walk or bringing the dog under control. Usually of nylon construction with a special reflective thread woven into the nylon to reflect light from oncoming traffic. An excellent device for walking the dog safely at night. Ancol make a range of collars, leads and rope leads incorporating this special reflective safety fabric. * Harness and Lead sizes relate to the collar sizes so if your dog fits a size 3 collar, he would fit a size 3 harness and also fit a size 3 lead. As a general guide the following breeds of dog show the Harness sizes based on an average size and weight of the mature dog. For crossbreeds choose the type your dog most resembles by size comparison. Measure the dog from the base of the neck (where the collar sits) to the base of the tail. Below is an approximate guide of these measurements. Afgan Hound - 65-80cm/26-32" Dalmatian - 60-65cm/24-26" Pomeranian - 25-30cm/10-14"
Airedale Terrier - 55-60cm/22-24" Dandie Dinmont Terrier - 35-40cm - 14-16" Poodle (Standard) - 55-60cm/22-24"
Akita - 65-75cm/26-30" Doberman Pinscher - 60-70cm/24-28" Poodle (Miniature) - 35-40cm/14-16"
American Foxhound - 55-60cm/22-24" English Setter - 55-65cm/22-26" Poodle (Toy) - 20-25cm/8-10"
American Water Spaniel - 40-45cm/16/18" English Springer Spaniel - 60-70cm/24-28" Pug - 30-40cm/12-16"
Australian Terrier - 25-30cm/10-12" Fox Terrier - 35-45cm/14-18" Rottweiler - 55-65cm/22-26"
Basenji - 30-35cm/14/16" German Shepherd - 65-75cm/26-30" Saluki - 55-65cm/22-26"
Basset Hound - 55-60cm/22-24" Golden Retriever - 60-75cm/24-30" Samoyed - 50-60cm/20-24"
Beagle - 35-40cm/14-18" Great Dane - 70-80cm/28-32" Schnauzer (Standard) - 50-60cm/20-24"
Bedlington Terrier - 40-45cm/16-18" Greyhound - 60-70cm/24-28" Schnauzer (Miniature) - 35-45cm/14-18"
Bichon Frise - 35-45cm/14-18" Irish Setter - 60-70cm/24-28" Scottish Terrier - 35-45cm/14-18"
Border Collie - 40-45cm/16-18" Irish Terrier - 45-50cm/18-20" Sealyham Terrier - 40-50cm/16-20"
Boston Terrier - 40-45cm/16-18" Jack Russell - 30-35cm/12-14" Shar-Pei - 50-60cm/20-24"
Boxer - 50-60cm/20-24" Japanese Chin - 30-40cm/12-16" Siberian Husky - 60-70cm/24-28"
Brittany - 55-60cm/22-24" Kerry Blue Terrier - 50-55cm/20-22" Silky Terrier - 30-35cm/12-14"
Brussels Griffon - 20-30cm/8-12" Labrador Retriever - 55-65cm/22-26" Skye Terrier - 45-50cm/18-20"
Bulldog - 40-50cm/16-20" Lakeland Terrier - 40-45cm/16-18" Springer Spaniel - 60-70cm/24-28"
Bull Terrier - 45-55cm/18-22" Lhasa Af So - 35-45cm/14-18" St Bernard - 70-80cm/28-32"
Cairn Terrier - 35-40cm/14-16" Maltese - 25-35cm/10-14" Tibetan Terrier - 45-55cm/18-22"
Cavalier King Charles Spaniel - 30-40cm/12-16" Manchester Terrier (Standard) - 35-40cm/14-16" Vizsla - 65-75cm/26-30"
Chihuaua - 20-30cm/8-12" Manchester Terrier (Toy) - 25-30cm/10-12" Weimaraner - 65-75cm/26-30"
Chow Chow - 45-55/18-22" Miniature Pinscher - 25-35cm/10-12" Welsh Corgi - 40-45cm/16-18"
Cocker Spaniel - 40-50cm/16-20" Norfolk Terrier - 25-30cm/10-12" Welsh Terrier - 35-45cm/14-18"
Collie - 40-50cm/16-20" Old English Sheep Dog - 70-80cm/28-32" West Highland Terrier - 45-55cm/18-22"
Corgi - 40cm/16" Papillon - 30-40cm/12-16" Wheaten Terrier - 45-55cm/18-22"
Dachshund (Standard) - 40-50cm/16-20" Pekingese - 30-40cm/12-16" Whippet - 45-50cm/18-20"
Dachshund (Miniature) - 25-30cm/10-12" Pointer - 60-70cm/24-28" Yorkshire Terrier - 20-30cm/8-12"
Stand your horse on a level surface. Pass the tape measure around his body where the girth will rest - between his elbows and withers. Make the two ends meet and pull it snugly. This is your horse's heart girth. This simple formula will calculate your horse's girth size. Take your measurement in inches, divide it by three, multiply by two and subtract 2. The resulting number will only be an estimate, but it is a good starting point for ordering the correct size. Deduct 24" off a GP girth to find out what size of dressage girth is needed. Measure your hand with a tape measure around the knuckles of your hand (indicated by the black arrow in the illustration). Measure your dominant hand - the right if you are right handed, and the left if you are left handed. Note: Some manufacturers indicate glove sizes by Inches and others by Small, Medium and Large, etc. We always indicate the size of a pair of gloves the same way the manufacturer does. Please use the tables belw to find your size. Your gloves should fit a bit loose - they'll form fit with use. Below is a rough guide to what size headcollar or mask would fit which size horse or pony but obviously each horse or pony is different in size and shape so actual sizes may vary to the guide below. This chart is an indication only. We always recommend that proper measurements are taken before you make a purchase. 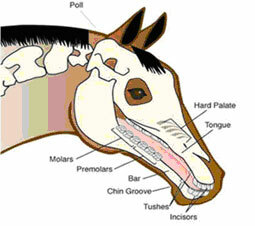 All Horses mouths and tongues vary in size and shape, the bit must be the correct size and type for your horse. Depending upon the manufacturer horse bits are either measured in inches or centimeters. They are measured along the mouthpiece from the inside of one ring/cheek to the other. A horses bit should fit comfortably across the bars (the toothless gap between the incisors and molars) of the horses jaw. When fitting a bit you should look inside the mouth to check this is the case and not rely on the rule "there should be a wrinkle of skin at the corners of the horse's mouth" as this rule doesn't always hold true. A bit should fit your horse's mouth so that the mouthpiece extends approximately 1/4" beyond the horse's lips on either side. If the bit is too small it may cause pinching and if too large may not act in the way it should. How to measure what size your horse needs. This is most easily done by putting an old bit in the horse's mouth and gauging from that how much larger or smaller you require. If an old bit is not available a piece of string or doweling can be used. Make a knot in one end of the string or a mark on the doweling. Then put the string/doweling in the horses mouth as the bit would be. Allow the mark/knot to line up with the horses lips on one side and then mark the string/doweling on the other. This can be measured to give the size of the mouth, then add 1/2" to give the size of bit required. Here is a rough guide to bit sizes but each individual horse may vary from this guide. Cob 8 1/4" 10 1/4"
Boots do not need to fit as closely to the horse's legs as wraps or chaps, but care must still be taken when selecting what size your horse needs. To measure your horse's leg, simply measure the circumference of his cannon bone to determine which tri-zone size your horse needs. Getting the correct size for your horse will provide him with the maximum level of comfort and protection. 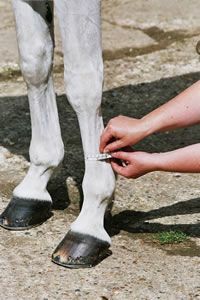 Measure your horse's leg as described above to decide on the size of wrap your horse needs. 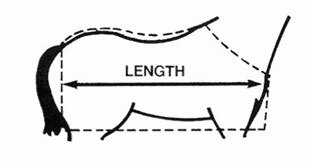 Simply measure your horse's leg as described above, and refer to the appropriate table on this page, according to the type of chap you require. Getting the correct size is so important with these chaps. If they are too big, they will slip down or allow mud to get under the chap, too small and stress will be exerted on the seams leading to splitting. Close Contact Chaps and Hardy Chaps are not suitable for horses with an allergy to neoprene. Stable Chaps do not contain neoprene. Medium Narrow only available in Training Wrap. Why use boots, wraps or chaps? Horse boots, wraps and chaps are used for a variety of reasons, from turnout to competition and everything in between. If a horse trips when out hacking, has poor conformation, a previous injury such as a splint or is susceptible to a condition such as mud fever, fitting your horse with a set of boots, wraps or chaps will offer your horse an invaluable layer of extra protection. Ponies, Small Thoroughbreds, Young stock. Thoroughbreds, Crossbreds, Racehorses, most Warmbloods, most Riding Club Horses. Hunters, large Thoroughbreds, Large Warmbloods and horses with heavy bone. If you have a new horse or are just unsure which size rug your horse needs, using a tape measure (or a piece of string you can measure later) measure your horse from the centre of his chest, horizontally along his side finishing where you require the rug to finish. It is best to allow an extra 3" on top of this for turnouts in most cases, especially if the turnout has a neck cover. Stable rugs are usually correct at the measured size. Rugs are sized in feet and inches, in increments of 3". If your horse is between sizes you are usually better to go up a size than down, unless the horse is narrow chested or petite. Ideally, an existing rug in the correct size can be measured all the way along the bottom edge to give the size required. How can I tell if my horses rug is too big or too small? If the turnout or stable rug extends beyond the top of the tail (check when your horse has his head down too as often the rug will pull forward into the correct position when grazing, you can test this by asking the horse to lower using a treat), the rug is too big. If the rug does not reach the top of the tail, the rug is too small. How should leg straps and surcingles be adjusted? You should adjust leg straps and surcingles to allow a hands width between leg/belly and strap. If the leg straps and/or surcingles are not adjusted to allow a hand's width, your horse could get his legs caught in the straps if too long, or they may rub if too short. How should the neck of the rug fit? It is important to adjust the front straps on the rug to ensure that the top of the rug sits in front of the wither, not behind or it will pull back and an cause rubbing and sores on the shoulders, neck and withers. You should be able to easily get your hand down the front of the rug and it should be mobile enough to move forward and backwards over the horses coat, wither and shoulders. If the neck of the turnout or stable rug is too big, the rug will probably also hang off the back of the horse, which will place pressure on the shoulders and increase the possibility of rubbing and slippage. My turnout rug says it is "Ripstop" but it has ripped, is it faulty? Ripstop is the name used to describe the weave within the fabric of some turnout rugs and helps to contain rips. The distinctive ‘checkerboard' pattern of Ripstop is actually a series of reinforced strands interspersed within standard weave fibres and these thicker, stronger areas (the borders of the ‘checkers') help to prevent a rip from spreading once it starts. Ripstop fabric on a horse rug does not guarantee that the fabric will not rip at all. Importantly, the stronger areas are actually designed to rip should your horse gets caught or stuck in any way which is imperative to his safety. What is meant is waterproof and breathable in turnout rugs? This is the ability of your Rug to protect your horse from the elements - particularly rain - while at the same time, keeping your horse comfortable by allowing sweat and perspiration to ‘wick' away and pass through the Rug's fabric to the outside air. Breathability can be effected by a number of factors, more expensive rugs will have a far greater ability to breathe than cheaper ones due to the more technical nature of the fabrics used. Most breathable rugs achieve breath ability using a special ‘hydrophilic' (water-loving) coating to the underside of the material. This coating prevents water droplets from passing through it from the outside inward, but uses the temperature differences between the horse and the air to allow perspiration molecules to travel through the fabric and evaporate, leaving your horse dry. Waterproof refers to the material used in the production of the rug only, as all rugs contain stiching and fastenings which it is not always possible to tape and make 100% waterproof. We always advise a spare rug be available in case of prolonged extreme weather conditions. How many rugs do I need? Ideally, you should always have 2 turnout rugs for your horse, these can be different weights as thicker rugs can be layered underneath if necessary for the short term. Turnout rugs will often need longer than a few hours to dry, or could be ripped or damaged by the horse and need repairing so a spare is often a necessity. If your horse is stabled, you will need stable rugs as well are turnouts, and ideally you need a range of warmths. This combination will allow you to cover all weather and temperatures with the use of layering if necessary, travelling and cooling your horse down and keeping him warm after exercise. A horses' rug is like any clothing article and should be hung to dry in a well ventilated, dry area if it is removed when it is still wet or damp. Occasionally, in prolonged and heavy rain, some moisture penetration may occur particularly in the sewn areas of the rug. This is not significant and due to the positioning of the stitching (particularly on seamless rugs) will not affect the rug's performance and is not a fault in any way. How do I clean my horses rugs and should I reproof them? Your rug should be cleaned before storage with cold water and a very soft broom or similar (do not scrub). Specially manufactured cleaning solutions such as Nikwax may be used but no detergents or other products as they will attract water onto the rug when in use and will destroy the water repellancy. Rugs must be totally dry and aired before being stored to avoid any mould or rotting of the stitching. It is often advantageous to reproof your rug once a year if necessary. Falabella Rings are available in three sizes. Use this guide to find the equivalent size for your country. Falabella Rings come in Small, Medium and Large. E.g. US 6/7/8, Euro (mm) 16.5/17.3/18.2. Chest Size (inches) 34" 36" 38" 40" 42" 44" 46" 48"
Waist 24" 26" 28" 30" 32" 34" 36" 38" 40"
Seat to Fit 32/34" 34/36" 36/38" 38/40" 40/42" 42/44" 44/46" 46/48"
Inside Leg Regular 30" 30" 30" 30" 30" 30" 30" 30"
Inside Leg Long 32" 32" 32" 32" 32" 32" 32" 32"
Zip Welt Pocket Length 5" 5" 5" 5" 5" 5" 5" 5"
Zip Fob Pocket Length 3.5" 3.5" 3.5" 3.5" 3.5" 3.5" 3.5" 3.5"
Zip Fly Length 5.75" 6" 6.25" 6.50" 6.75" 7" 7.25" 7.50"
Patch Length 13" 13" 13" 13" 13" 13" 13" 13"
Waistband Width 1.5" 1.5" 1.5" 1.5" 1.5" 1.5" 1.5" 1.5"
Chest Size 36-38" 40-42" 44-46" 48"
Collar Size 15.5" 16" 16.5" 17"
Chest (Inches) 36" 38" 40" 42" 44" 46"
Waist (Inches) 30" 32" 34" 36" 38" 40"
Collar (Inches) 14.5" 15" 15.5" 16.5" 17" 18"
A Helmet that Doesn't fit will NOT protect you if you fall. After being subject to a severe blow a hat should be replaced, even though there may be no visible sign of damage. To measure for a riding hat, you need to place the tape measure around your haed, sitting just above your eyebrows and ears. take the measurement in centimeters and refer to the chart below for the relevant skull/riding hat size required. Please note that riding hates do vary in shape and two hats in the same size may fit slightly differently. Generally we find skull hats fit rounder shaped heads better than traditional styled riding hats. It is useful to take a template for the saddler so that we can gain an idea of the fit the horse will need. To do this you can use a 'Flexi Curve' which can be purchased from most art/stationary stores, if you are unable to obtain one of these then a bendy wire coat hanger will suffice. Mould the ‘Flexi Curve’ or wire coat hanger over the horses withers where the front points of the saddle fits. Draw around the template on a plain piece of paper, A4 size will be good. A second template of the horses back can be taken by placing the 'Flexi Curve' down the horse's spine from the wither towards his tail, this will give our saddlers an idea of the horses back confirmation which may also help in finding a suitable saddle. Horses vary in breed and confirmation. A wide range of horses are generally easy to fit but certain breeds such as cobs, Arabs and high withered thoroughbreds can be a little bit trickier. There are styles of saddles which are specifically made for these types of horses which maybe more suitable. As well as it being essential that the saddle fits the horse, it is also important to fit the rider. Style is often important depending on what you are doing e.g. : dressage, showing, show jumping etc. The most popular style is General Purpose which is suitable for all levels of riding and competition. Dressage and Jumping saddles are more specific styles, for e.g., you would not wish to show jump in a dressage saddle. Stand your horse on a flat surface and stand him square. Place the saddle on the horse back. Look for the saddle to sit level across the tree from pommel to cantle. The bearing surface needs to have a good contact all along the horses back with no bridging in the centre or rocking. There needs to be good clearance of about 3-4 fingers at the pommel as well as clearance along the horse spine. Once the fit looks good at this point then girth the saddle up. If the saddle is still sitting level without excessive lifting off the horses back, then the rider can sit on the saddle. Once the rider is in place, check again the clearance of the saddle with someone viewing from the ground. The saddle will have dropped slightly with the rider’s weight but still requires 3 fingers clearance at the pommel with good clearance down the spine; you should be able to see daylight through the channel. At this point you need to see the saddle ridden in all three gaits, again by someone viewing from the ground. Check the saddle is sitting relatively still with no excessive bouncing or lifting off the horses back.